The Progeny Author Interview + Giveaway! So much for my New Year's resolution to blog more :/ Can I blame spending the month of April in Australia and having to finish DAWN STUDY? No? Sigh. Well, I'm back with another Author Interview and this time with the lovely, talented Tosca Lee! Her book, THE PROGENY came out today and I was lucky to be able to review an ARC and provide a blurb. My blurb: Be warned, once you start this book, it's impossible to put down! 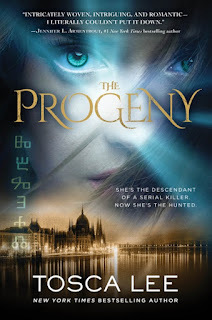 Also Tosca is giving away one copy of THE PROGENY - see the Rafflecopter below to enter to win! This is open to residents in the USA and Canada only. Cover copy: Emily Porter is the descendant of a serial killer. Now, she’s become the hunted. She’s on a quest that will take her to the secret underground of Europe and the inner circles of three ancient orders—one determined to kill her, one devoted to keeping her alive, and one she must ultimately save.